You might not be used to long-distance bus travel. But in Brazil, buses are an important and useful way to travel the country. And for a land with plenty of inconveniences for travellers, the intercity buses are generally surprisingly comfortable and pleasant. We’ll show you how to avoid the few pitfalls to Brazilian bus adventures, and make sure you get where you need to be in style. We’ll talk about when to take buses versus flying and other modes of transportation, how to buy tickets, and how to ensure a smooth ride the day of travel, including necessary basic vocabulary for bus travel in Portuguese. Brazilian buses, such as with this fully reclining seat in lieto class, can actually be pretty comfy. 1. Know the basic vocabulary for Brazilian bus travel: We’ve put together a little list below. 2. Book your tickets at least a couple of days in advance — and our best advice for that right now is via ClickBus. (Unfortunately it’s Portuguese-only, but perfectly serviceable with the Google Translate browser extensions.) There are a lot of other websites for bus tickets (as detailed below), but they generally fail for foreigners (those with foreign credit cards or no Brazilian tax ID number (CPF)). You can also buy bus tickets directly in the bus stations, if you’re willing to take your chances the day of travel. 3. Bring a sweatshirt and long pants, or anything to keep warm. Brazilian buses have infamously frigid air-conditioning. Details below on this and other bus necessities. 4. Bring food or prepare to eat in roadside diners: There is no food service on board, but there are stops of a half hour or so where you can eat at sometimes-decent-but-never-great restaurants/bakeries. Pay attention to the time allotted for rest stops and use it wisely. Generally the stops are announced for 20 or 30 minutes, but check with the driver to confirm. Details below. 5. 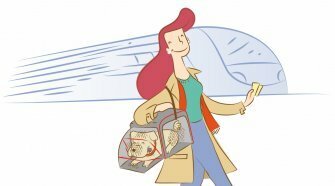 Know the boarding procedures: Ensure that you get on the right bus, check your bag under the bus if you don’t have a carry-on, have your passport ready, find your seat, and know everything you need to start a smooth ride. 6. Collect your bag and find a taxi/uber/public transport when you get off the bus. Details below. 7. Brazilian buses are generally quite safe but don’t be afraid to speak up for yourself, loudly, and seek help from the driver or other passengers if needed. The neighborhoods around big-city bus stations, however, can be quite seedy and a taxi is worth it. Keep your valuables (wallet, phone, passport) on your person in the bus station, at stops, and on the bus. More below. Intro: Is It Better to Fly or Take a Bus in Brazil? This article was first published on January 25, 2019. We have an admitted bias towards land travel whenever possible. It’s better for your carbon footprint, and generally being crammed into airplane seats is an uncomfortable and miserable experience. That said, the distances can be enormous in Brazil, and a two-day bus trip from Rio to Salvador isn’t exactly inviting, especially when there are (sometimes cheap) flight options to cover that same distance in a few hours. If you want to compare flights to buses, Rome2Rio has a useful search feature to directly compare those options, though it does not have all bus nor plane options. 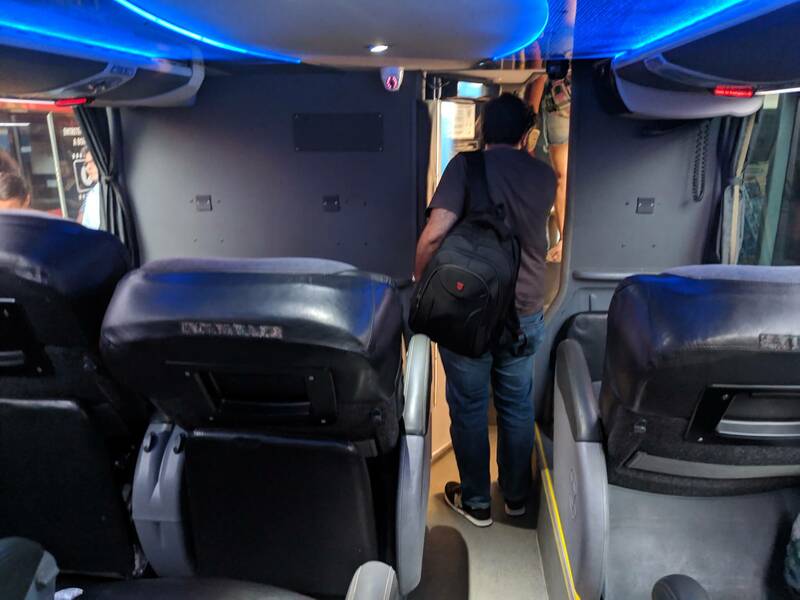 For actually booking buses, ClickBus works much better and has more complete offerings; likewise Expedia is smoother for non-Brazilians than Brazilian airline sites, which have tons of frustrations). You can also use Google Maps to get a very general (and optimistic) idea of driving times, and note that buses go a bit slower and take stops of a half-hour or so every four hours. Easier-to-access bus stations (rodoviárias) are generally in the middle of a city (as opposed to airports, which at times are quite far, such as with São Paulo’s Guarulhos Airport). Buses can get you to smaller, out-of-the-way areas that are not accessible or expensive to reach by plane. Brazilian buses are comfortable. The seats are large, especially the leito (bed) option, and recline nearly completely. Most people sleep well on overnight buses. 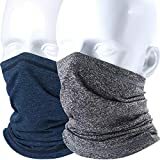 The air-conditioning can actually be too strong, so you’ll want to bring something warm to wear. Bus tickets are cheaper. Unless you get a discount deal on a very long-distance flight between Brazilian cities, bus tickets will almost always work out cheaper than the corresponding flight. And, on buses, there are generous baggage limits, plus nobody actually weighs your bags and tries to nickel-and-dime you for the baggage restrictions. Buses are actually faster for shorter distances, as there is no need to arrive in advance (a half-hour is fine), and transport time to and from the bus stations is faster than to airports, usually. If you’re going from Rio to São Paulo, for example, the six-hour bus ride may actually be faster than the one-hour flight when you figure in time getting to and from the airports, waits, lines, security, and checking and retrieving bags. Overnight bus rides save you nights spent in a hotel. If you’re spending a few weeks in Brazil and you do three overnight bus rides in that time, leaving one city in the evening and arriving the next morning in another, you’ll have saved three total nights of lodging expenses for the trip. Experiences will vary, but I’ve generally slept well on Brazilian buses and most others seem to do so as well. 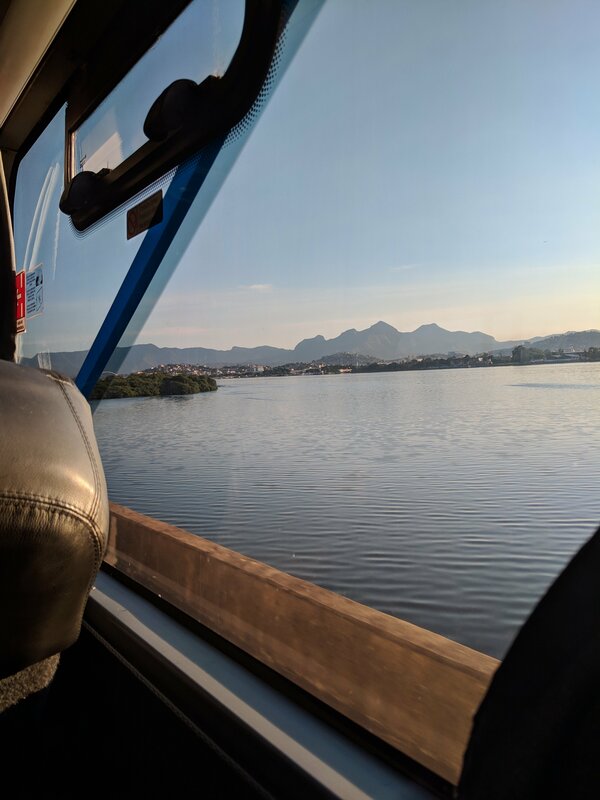 The opportunity to meet Brazilians and travel as they do: Nearly all Brazilians take advantage of their bus systems at some point for some sorts of travel, so bus adventures can be a great way to meet people from a great cross-section of Brazilian life. Flying is faster for longer distances. While people can and do take several-day long bus trips to cross Brazil, if you need to go a long distance all at once it’s generally more convenient to fly. Airline staff is more likely to speak English. While not a given, there is generally at least some staff in Brazilian airports and on flights that speak passable English. This is not at all guaranteed on buses, where there will be more smiling and pointing. Buses can get delayed more often by things like rush hour, accidents, and road conditions. It’s not uncommon for an overnight bus ride to arrive an hour later than scheduled. Take their scheduled arrival times with a grain of salt. City bus terminals are generally much easier to reach than airports in Brazil, as with this passage from metro station Tietê to the main Tietê Bus Terminal in São Paulo. Brazilians working in the bus sector generally don’t speak a lot of English, or necessarily any. But they’re also generally friendly, honest, and professional, and will make an effort to understand you and be understood, especially if you’re friendly and acting in good faith. I’m fluent in Portuguese and have been travelling on buses for years in Brazil; here’s my take on the vocabulary that a non-Brazilian would most want to have for a bus trip. If you’re asking a question, note that Brazilian tones are quite exaggerated. As a rough guide, you often need to start at a mid-pitch, immediately go high, and then end lower trail off towards the end. It’s important to do this in many cases so that Brazilians realize you’re asking a question instead of stating information. Onde fica … a parada / a rodoviária / a plataforma / o ônibus? — Where is … the bus stop / the intercity bus station / the platform / the bus? Onde ficam os banheiros? — Where are the toilets? Esse ônibus vai para São Paulo? — Is this bus going to São Paulo? De quanto em quanto tempo saem os ônibus? — How often do the buses leave? Qual horário vai chegar? — At what time does it arrive? Com licença, vou descer nessa parada. — Excuse me, this is my stop. Quanto tempo vamos ficar parados? — How long will we be stopped here for? Qual horário vai sair? — At what time does it leave? Estamos atrasados? — Are we running late? Onde posso comprar uma passagem para Florianópolis? — Where can I buy a ticket to Florianópolis? Quanto custa? — How much does it cost? There are some particularities to know about the booking process and what’s on offer. 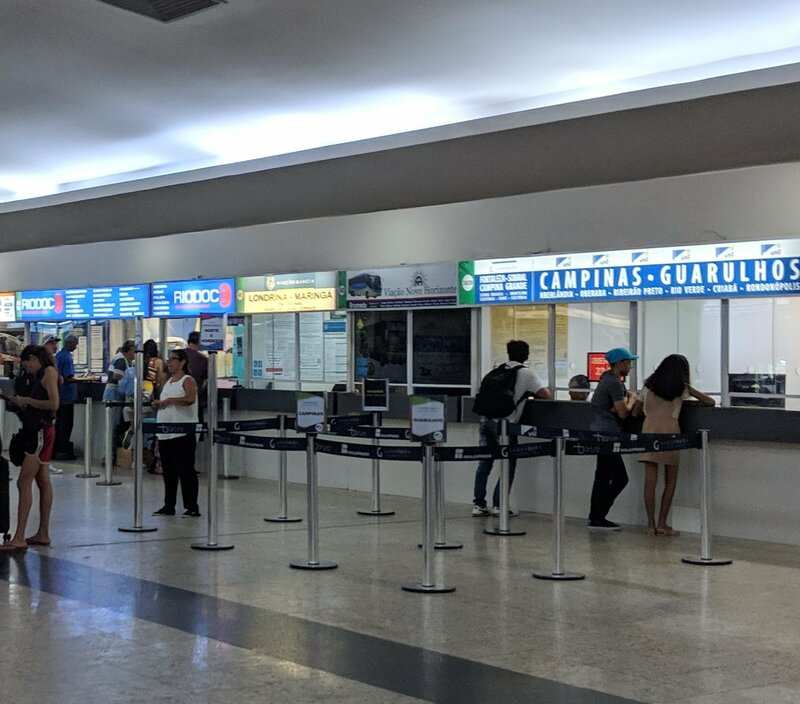 The Sao Paulo bus terminal ticketing area; fortunately you can also just purchase your tickets online. Thankfully, there are lots of websites that now offer Brazilian bus tickets, so there’s generally no need to make an extra trip to the bus station several days in advance to make sure that you’ll have a seat on the day you want to travel. Brazilian bus websites generally require a CPF number, or Brazilian taxpayer ID number, to run any purchase through. This number must match the credit card, and you cannot invent a CPF number or use your own country’s ID number instead, as the CPF is always automatically checked. Brazilian bus sites also generally require a Brazilian credit card with a Brazilian address. The websites are poorly translated or not at all. The best workaround for these problems is ClickBus, which is by far the most hassle-free site I’ve used. Brazilians themselves love it too, and it accesses a whole range of bus companies that criss-cross Brazil. It works great as long as you have a PayPal account, which I highly recommend having set up before you travel to Brazil in any case as it helps for other online Brazilian purchases. The biggest problem with ClickBus is that the Brazilian site is still Portuguese-only, so you may want to run the excellent Google Translate extension (for Chrome, Firefox) as you buy to make sure you understand what you’re getting. 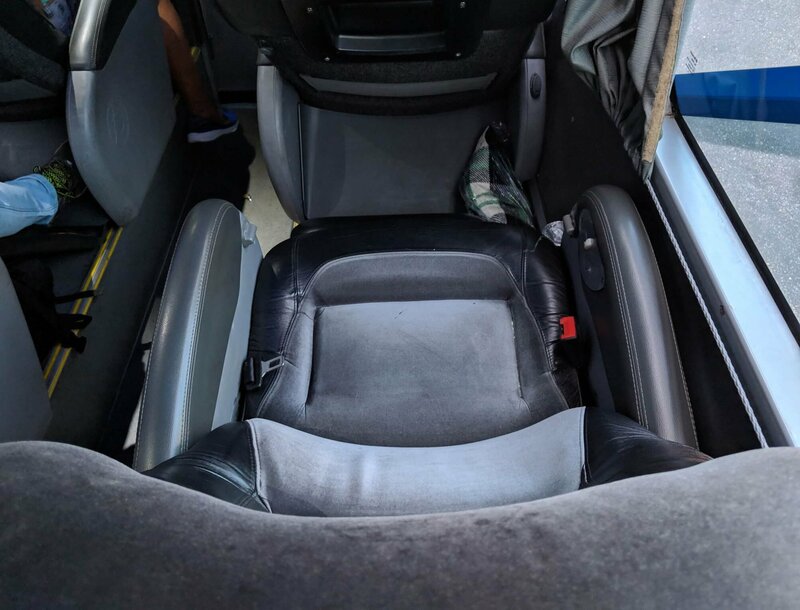 Another option that other foreigners in Brazil have had success with is Busbud, which has a simple interface and good coverage. However, on my last trip it gave a lot of errors and was ultimately unable to complete payment, so I’m iffy on recommending it until I and others have had more success with it in Brazil. Finally, you can always have a Brazilian friend complete the purchase for you, with their Brazilian CPF number and credit card. And if nothing else, there’s always the old-fashioned method; actually go to the bus station and buy a ticket directly from the company’s ticket window. The lieto class has three seats across the width of the bus. These are the options you may be presented with, depending on the bus company and the route. The classes are standardized across bus lines to offer the same amount of space and level of reclining. 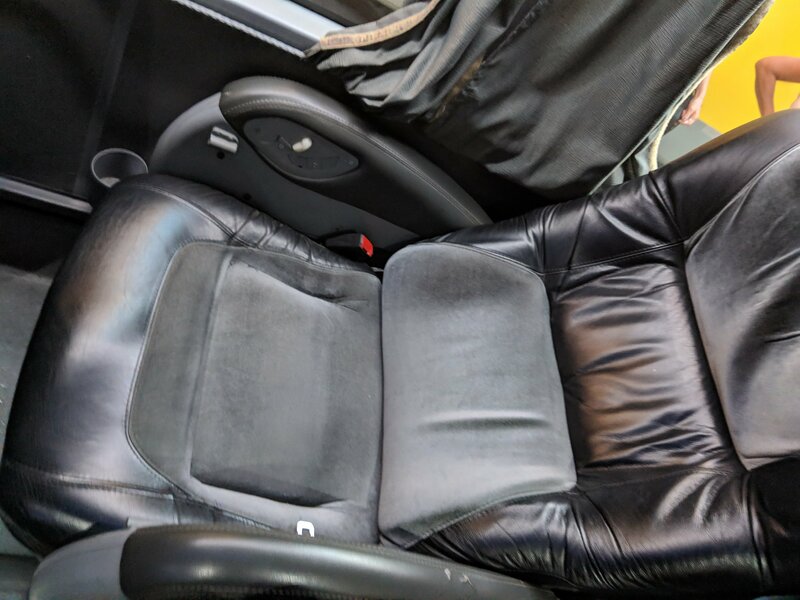 A lieto seat on a Brazilian bus; a blanket was also provided. In my opinion, the semi-leito or leito options are well-worth-it for getting rest on overnight trips, and are also often less crowded, less noisy, and less likely to have lots of tiny kids making fusses. If you’re hoping to read or nap they can also be great even for trips during the day. When choosing your seat, attempt to intuit where the toilets might be if they are not marked, and sit far from them to avoid the noise of the door opening and closing and foul odors. That said, the toilets don’t actually get a lot of use usually, as most people wait for the rest stops. They can come in handy however if you’re suffering intestinal distress from Brazilian water. Bus ticketing windows for various companies in the São Paulo Tietê Bus Terminal. 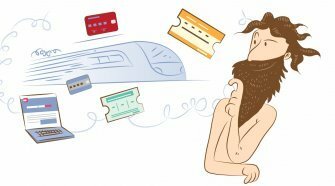 The receipt or “voucher” that you were emailed when buying the ticket online is not enough to actually get you on the bus. 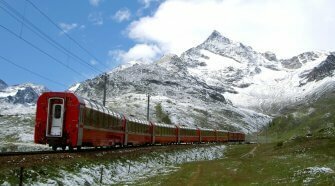 You will need to actually withdraw your ticket from the ticketing window of the company that you are travelling with. Go to the ticketing area and if in doubt, ask at an information desk where to find the company you’re looking for, or just ask anyone working at any other ticket desk and they’ll usually happily point you to your company. When you get to the ticket window you’ll need to show a copy of your passport, and the number should match the ID number you gave when purchasing the ticket. In some cases the ticket seller tells you to print the email with your voucher, but in my personal experience I’ve never found this to be actually necessary. 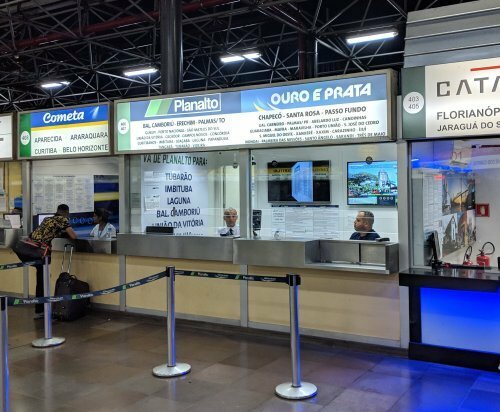 Your ticket will have your passport number printed on it, and the bus driver will likely compare to make sure that these numbers match when you board the bus; this is required if you’re crossing state lines in Brazil. If you did not purchase your ticket online, you will likely have to write your passport number on the ticket yourself. I’d suggest doing this at the ticket window right when you buy your ticket, so that you don’t have to try to borrow a pen from someone at the last minute when boarding the bus. Before leaving the ticket window, double- and triple-check that your ticket is correct and that you understand what platform you will be leaving from and where it is located. 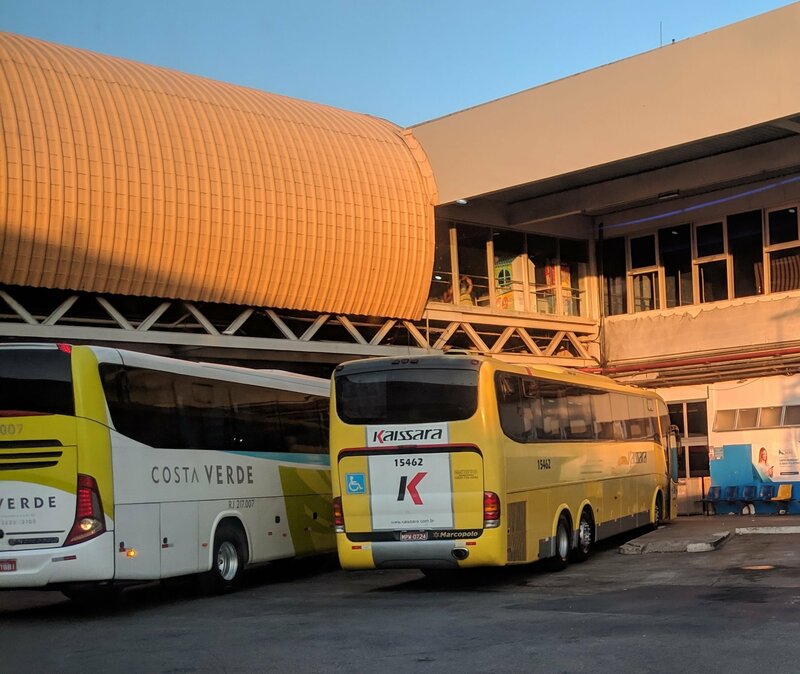 It may be the infamous 40 degrees celsius (104 fahrenheit) in Rio, but when your bus starts rolling out of the Rodoviária Novo Rio (as the terminal is called), you’ll be COLD. Air conditioning in Brazilian buses is out of all proportion to most human standards of comfort. This is hardly a fashion event, so dress comfortably. Here’s what we’ve found to work best in terms of comfort and packability (we go carry-on only). 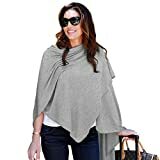 This multipurpose shawl/wrap can serve as a lightweight blanket on the bus or be worn in a variety of ways. 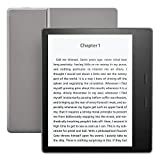 A kindle offers millions of books in a small slab, including Portuguese books and language learning features to help you look up words on the fly. 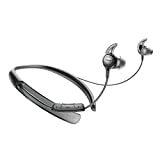 This model, the Oasis, is our top pick for Brazilian travel as it is IPX8 waterproof, and just as easy to read in bright sunlight on the beach as it is in a darkened long-haul bus (with its adaptive internal light). The battery lasts for weeks. See also our full list of what to pack for Brazil. The dining area in Rio de Janeiro’s Novo Rio Bus Terminal. The food within Brazilian bus terminals is fast food and generally terrible. There will be an assortment of fried breaded balls (salgados) and in larger terminals some fast-food chains. Once you’re on the road, you’ll stop every four hours or so. Brazilian roadside rest stops are pretty much identical; the ones that buses stop at will generally be quite large, with free bathrooms and a restaurant/bakery. Typically upon entering you will take a plastic tablet from a machine in order to pass a turnstyle. The things you order from the hamburger stand, bakery, restaurant, or store are all added to the order number listed on your tablet, and on the way out you’ll present the tablet to pay and then be able to use it to leave. Rest stops are usually 20-30 minutes; it’s always worth double-checking with the driver as you get off the bus to find out at exactly what time you will be leaving, to ensure there isn’t miscommunication or confusion. Part of the large upper floor in São Paulo’s Tietê Terminal. Arriving at a bus terminal, particularly a large one in a big city, can seem intimidating. But if you know where to go and what to do, the process is all pretty quick and painless. The ticketing area in the Novo Rio Bus Terminal. As described above, if you bought your ticket on ClickBus or another website, your first step is to get the actual physical ticket; a printout of the email confirmation is not accepted on the bus. Once you have your ticket you’ll make your way to your platform (plataforma). If you are catching a bus that started from another city, it’s possible that your bus will be delayed, especially depending on traffic conditions. Boarding the bus is orderly, with Brazilians queuing up just like the Brits do. Ha! It’s chaos, actually. But since your ticket indicates a seat reservation, there’s no reason to push about with the crowd of Brazilians to try to get on the bus quickly. Wait until the ruckus dies down a bit and then board. If you’re checking a bag or a suitcase, you’ll first take that to the worker placing these under the bus and be given a receipt — keep it safe, say with your passport. Then you’ll show your ticket and your photo ID (passport) in order to actually board the bus. It can be useful to ask the driver if you’re on the upper or lower floor before getting on a two-decker bus as this may not be marked. Be alert so as not to sleep through or misunderstand the announcement of your city’s stop. On arrival, you can use apps like Moovit or Google Maps to find public transport, or Uber or 99 (the later works better in some cities) to order a taxi. There are also official taxi options at most bus stations. If you’re using an app like Uber, the pickup point may be quite different than the pickup point for taxis; the app should direct you to the right place when you open it. Go there, and then call up your ride. In São Paulo and Rio for example, you cannot exit the bus terminals at the arrival point where the taxi stands are, for Uber you must instead go up to the ticketing floor and cross it out to the other side to where people are typically dropped off for their departures. In general, safety concerns in Brazil are often exaggerated by tourists and by Brazilians themselves (who often irrationally fear any city but their own, due to sensationalist television crime coverage). There is a high murder rate, to be sure, but this rarely affects those visiting the country. What tourists mainly have to be on the lookout for are scams and pickpockets at crowded tourist sites. Intercity buses are not magnets for such activity; you’re much more likely to get your phone stolen on Copacabana beach. 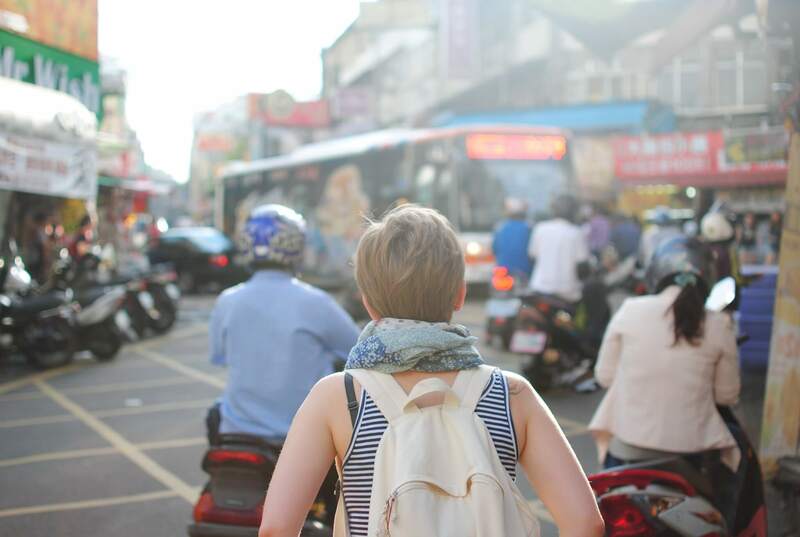 The neighborhoods around big-city Brazilian bus stations can be run-down, so for your piece of mind you may want to catch a taxi or ride service as described above, especially if you’re travelling with a lot of nice stuff. Brazilian men have a tendency to what other cultures regard as aggressiveness and harassment of women (which they may regard as “flirting” or “compliments”) — but fortunately this is at least somewhat on the decline with public awareness campaigns such as não é não (“no means no”). If you encounter any unwanted advances or behavior, speak up for yourself quite loudly and do not be afraid to embarrass the person and seek help from the driver or other passengers. If you are a woman receiving unwanted attention from a man, it is very likely that others will immediately take up your side and support you. Keep in mind that such incidents do happen but not generally on buses; anecdotally, single female travelers in Brazil have discussed all kinds of issues with Brazilian men, but I have yet to hear of incidents on long-distance buses, where there are plenty of witnesses and support. To head off any potential thieves, keep your important documents, passport, phone, money, etc. on your person. A passport holder or money belt can help. The view from the bus window coming into Rio is at times magnificent. This, I hope, is more than enough information to get you on your way for adventures in Brazil by bus. Elsewhere, we’ve also done our best to answer some of the more common questions about Brazilian buses. 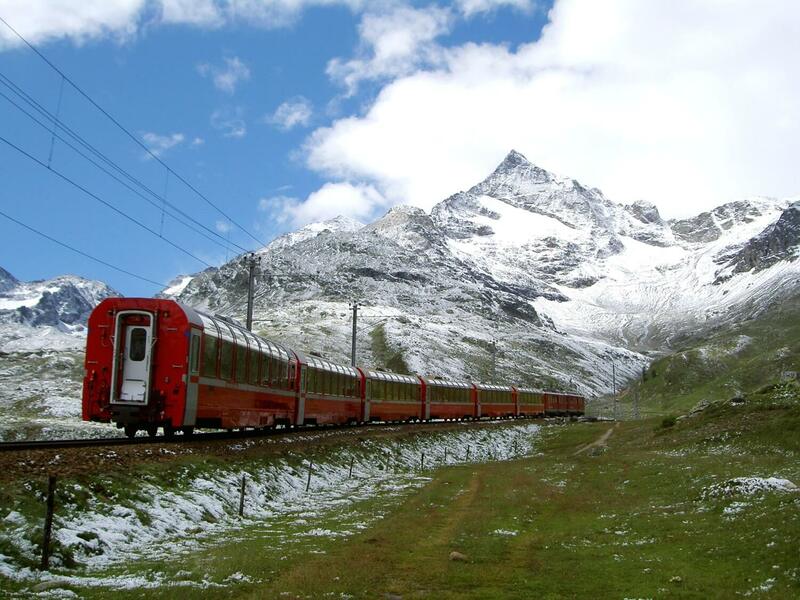 If it’s not obvious already, I love this mode of travel. There are excellent views, weird people, and pretty comfortable experiences. Being prepared with just a bit of knowledge can make it all go smoothly.